When it comes to digital marketing, techniques that are seen as separate entities often complement one another and help enhance your overall strategy. Content marketing and link building are shining examples of this effect, even though the two can involve different strategies and skills. When you are focused on creating content that knocks your audience’s socks off, you are likely not thinking twice about link building. I believe that the state of creating great content and thinking about link building is where the magic happens. And I’ll show you just why I believe that. When a webmaster decides that they are going to place a link to another website, that link is serving some kind of purpose. The link is being placed to give the audience more information or to serve as a source for credibility purposes. The reason the link is being built is mostly due to the content that exists on the outside source – not just any content, but valuable and relevant content. There is something about the content on that source that the webmaster deems worthy enough to give credit. This is where content and link-building work together; the content is strong in one aspect or another, and it is strong enough to be recognized by another source that provides a link back. These backlinks are kind of like saying, “hey, I think this content is pretty spectacular, and I want my audience to know about it.” Great content offers an avenue of link building at the webmaster’s discretion. OK, so it might not be quite that simple, but it is hard to deny that powerful content compels other likeminded marketers to give a link back to what inspires or educates them. Content that serves as a link building technique often provides fuel to other marketers in creating content of their own. Think about the last time you were writing a piece that required a lot of digging and research. Once you found a missing piece to your puzzle from another source’s blog, I am willing to bet that you had no problem linking back to that source. When you are writing web content with expectations to build links, your content needs to be at a level where your audience receives invaluable information. It can be hard to come across wow-factor content these days, and content that manages to be cutting edge will surely grab attention that can ultimately lead to links. You already know that your content needs to be top notch in order to receive links from high quality sources. So, what exactly is in the secret sauce for link worthy content? When you are whipping up content that builds links, here are a few ingredients to ensure that your content takes the cake. 1. Make it controversial. Remember when Copyblogger disappeared from Facebook not too long ago? Copyblogger announced the decision to leave Facebook on their blog, and it is unlikely that Copyblogger left Facebook in order to establish an extra link building technique. 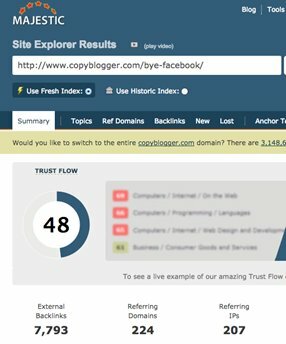 Using the backlink tool at MajesticSEO, you can see that Copyblogger’s blog post had 224 unique domains linking to the post after announcing their decision to leave Facebook. Disclaimer: I am not recommending that you create controversial content for the sake of trying to build a few links. If you are going to say or do something controversial, do it for the right reasons. Creating chaos in the name of link building is not the right reason. 2. Tell them something they don’t know. Just when they figured that they have heard it all before, throw them a curve ball. Not just any curve ball, though. The key here is still relevancy and value. Studies and statistics always enhance the value of your content, and independent studies help you establish authority online. It also establishes a source of education, which plays a big part in link building. 3. Be the first source to blog about or report on something big. A great example of this is when Search Engine Land first reported Google’s Pigeon algorithm update, and named the update accordingly. 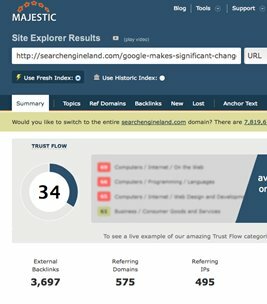 This particular post had 575 unique referring domains pointing to Search Engine Land as reference. However, do not try to be the first to report something just to beat your competition to the punch. Results for these actions can be catastrophic. Remember the Sandy Hook shooting of 2012? Originally, CNN reported the suspect’s brother as the shooter, probably as an attempt to be the first outlet to report the name of the suspect. The lesson here? Follow in the footsteps of CNN and lose all credibility. you both links and appreciation from the author. Create something your audience can use. Offering a template editorial calendar or a free eBook on the latest online marketing trends can get links pointing right to your website. 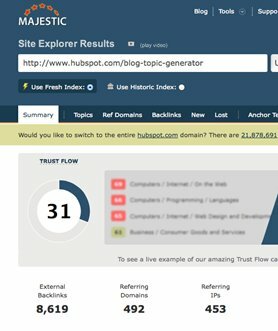 HubSpot’s blog generator tool has nearly 500 referring domains pointing to this content. Build links with infographics. Infographics are still a hot online marketing trend, and they are super easy and fun to share. Create an eye-catching infographic jam packed with great content, and there is a good chance you will get some of those brownie point links that everyone loves. Keep in mind that there are high authority websites that are used for infographic sharing. Once you have your snazzy infographic ready to go, share it on domains such as visual.ly and dailyinfographics.com. Offer a giveaway. When you are building back links, you need to try and point those links to onsite content if at all possible. Think of a desirable product or service that your niche offers and host a free giveaway of that product right on your website. The entry for that giveaway can include a badge linking to your website, or even a text link in a blog post. Guest post gigs can help you establish your own credibility as well as building links to your own site. Use the recommended elements for link worthy content to create a memorable guest post, or even contribute elements other than text content to earn more links. That infographic or slideshow that you created can easily be turned into a guest post if given the opportunity. It is important to remember that the quality of links that you earn can be more important than quantity. Focus your link building techniques on targeting credible sources that will help you establish a powerful source of links to your website. Links from high quality sources can help with search engine rankings, as well as give you access to new audiences for your own blog. In one way or another, building links from high authority and credible domains boils down to great content. Creating top notch content in your niche is like a magnet for link building; people can’t help but link to sources that educate and compel. If you use any technique for your link building tactics, stick to creating great content. Not only will you win with your audience, you will also stay on the good side of Google and earn a few well-deserved links from credible sources. If you plan your content around the sole purpose of link building, you might be setting yourself up to fail. Link building can be complicated and time consuming, and Google’s Penguin does not play nice to those who try to bend the rules of link building. Play it safe and let your content lead the way for your link building campaign. After all, great content always wins in the end.